Cape Cod has every sort of hotel, seaside resort, motel, inn, B&B and weekly rental cottage you might desire, from budget to luxury. Falmouth, Hyannis/Barnstable, Brewster, West and South Yarmouth, and Provincetown have the greatest variety and the largest number of lodging-places. From the 3-star, 142-room Heritage House Hotel in the center of Hyannis, going east along MA Route 28 through West Yarmouth and South Yarmouth for 7 miles (11 km) into West Dennis, is a commercial zone studded with hotels and motels from budget to very comfortable. None of these lodging places is on the beach, most are on the busy road, though the drop in traffic at night and the universal availability of air conditioning keeps the guest rooms quiet. 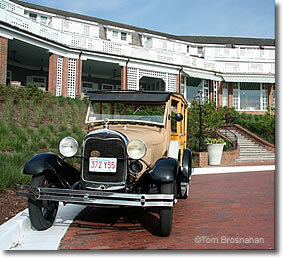 Chatham's lodgings are few, very nice, and higher-priced, like the famous Chatham Bars Inn. Provincetown has all sorts of hotels, motels and inns in all price ranges. 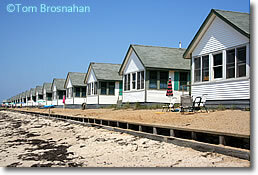 Harwich, Wellfleet and Truro have virtually no lodgings for one or two nights, but numerous weekly rental properties. Above, Chatham Bars Inn, Chatham MA.